the glamour attached to the profession today, a successful life in the kitchen is determined more by sacrifice than stardom, demanding a dedication bordering on obsession, all in pursuit of The Food. In this meditation on the culinary life that blends elements of memoir and cookbook, Paul Liebrandt shares the story of his own struggle to become a chef and define his personal style. 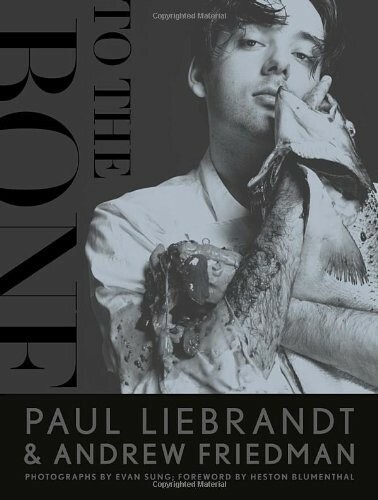 To the Bone is Liebrandt’s exploration of his culinary roots and creative development. At fifteen, he began his foray into the restaurant world and soon found himself cooking in the finest dining temples of London, Paris, and ultimately, New York. Taking inspiration from the methods and menus of Marco Pierre White, Raymond Blanc, Jean-Georges Vongerichten, and Pierre Gagnaire, Liebrandt dedicated himself to learning his craft for close to a decade. Then, at New York City’s Atlas, he announced himself as a worldclass talent, putting his hard-earned technique to the test with a startlingly personal cuisine. He continued to further his reputation at restaurants such as Gilt, Corton, and now the Elm, becoming known for a singular, graphic style that has captured the public’s imagination and earned him the respect of his peers. Punctuated throughout with dishes that mark the stages of his personal and professional life, all of them captured in breathtaking color photography, this is Liebrandt’s literary tasting menu, a portrait of a chef putting it together and constantly pushing himself to challenge the way he, and we, think about the possibilities of food.